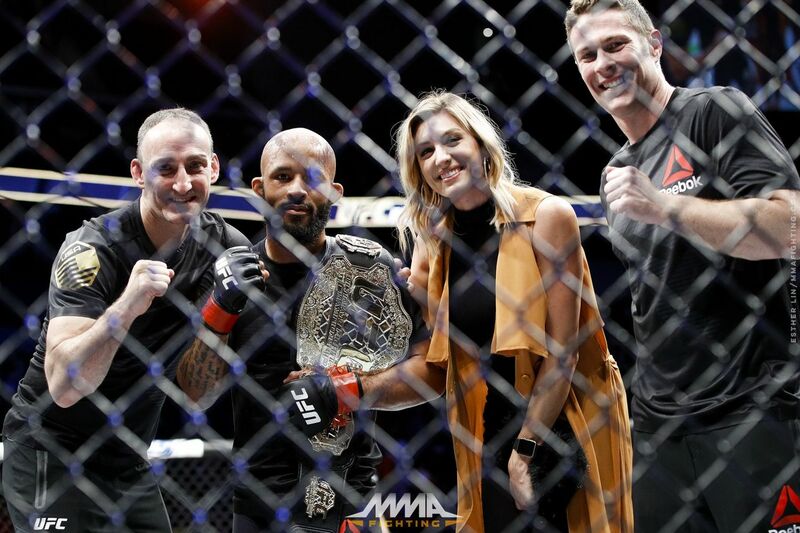 Demetrious Johnson’s belt collection is finally starting to grow. The UFC generally tends to give a new belt to the winner of a title fight, allowing champions who put together a string of title defenses to amass a collection of belts as keepsakes. For whatever reason, Johnson, who by this standard should now have 10 UFC flyweight belts in his collection, hasn’t been getting them. But he’s most definitely taking home the one he was awarded on Saturday night for his victory over Wilson Reis at UFC on FOX 24, which tied Anderson Silva’s record for most successful title defenses. Johnson’s motivation here is simple: He wants to take a picture, similar to a series of famous ones taken by boxing legend Floyd Mayweather, with all of his belts at the same time, something that shows off the scope of what he’s achieved in the sport. Speaking of belts, another titleholder, bantamweight champ Cody Garbrandt, has made noise about fighting Johnson. But while DJ earlier in the week expressed a willingness to go up to 135 and fight him, the more he thinks things through, the more he feels Garbrandt should follow through on his initial offer to go down to 125. “The whole thing with Cody is, I’ve never turned anyone down who’s come to my weight class,” Johnson said. “I have nothing but love for the guy, but at the same time, he just won a belt. I defended it 10 times and have been in the sport longer than he has. If he comes down to 125, we welcome it. But he doesn’t get to dictate. Maybe he does get to dictate according to Dana White, but at the end of the day, it is what it is.